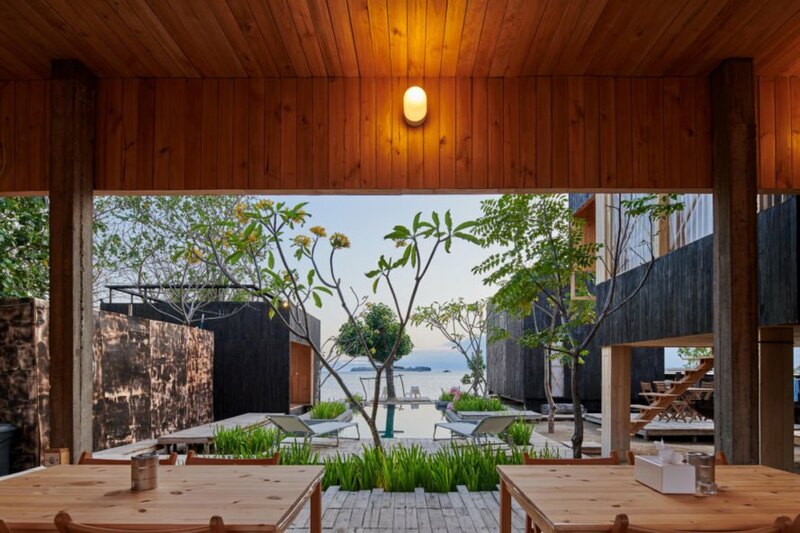 Indonesian firm Atelier Riri has designed a stunning eco-resort on the Indonesian island of Lombok. The small Kiyakabin Resort is an intimate, village-esque layout with just four cabins that open up to breathtaking, beachside views of the Bali Sea. The retreat’s cabins were made with locally-sourced charred timber and built with traditional construction methods by local builders. The Kiyakabin resort has just four units: three accommodations and a communal restaurant and dining area. The guest rooms are arranged in a strategic manner with the swimming pool at the center. 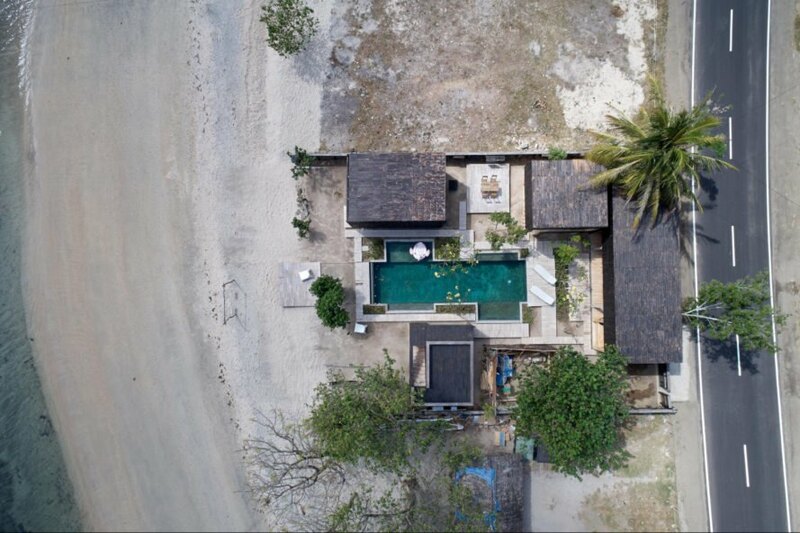 This was an intentional decision by the architects to pay homage to the traditional villages of the local Sasak ethnic group. The four cabins were constructed out of a timber frame and clad in locally-grown teak wood that was charred using the Shou Sugi Ban technique. 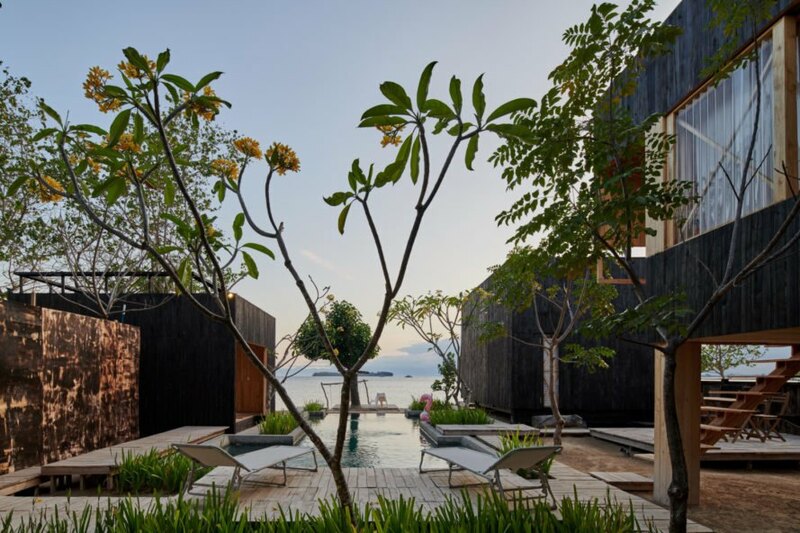 The charred timber facades not only give the resort a modern feel; it is also a strategic feature that will protect the buildings from the affects of the sea climate. 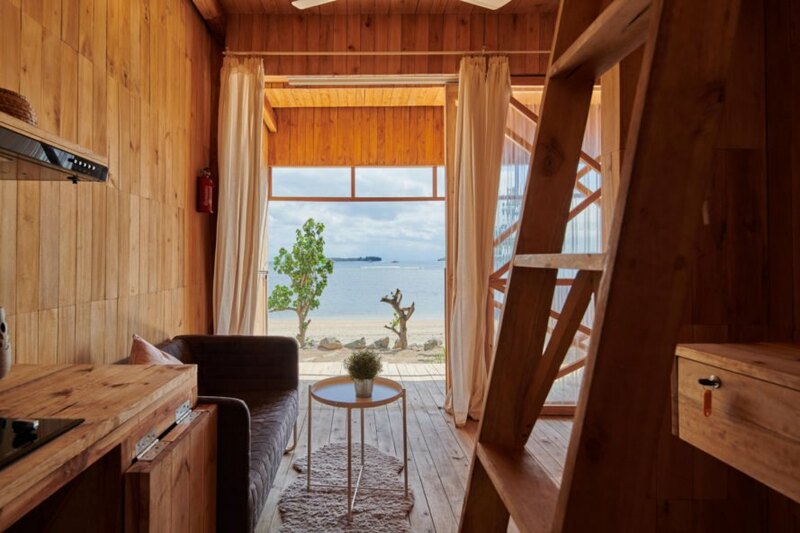 Two of the four timber cabins sit on the ground, with one facing the beach and one facing the swimming pool. The third cabin is raised off the ground on stilts to provide stunning views of the natural surroundings. The fourth and largest cabin houses the restaurant and dining area. This space is open on two sides to provide beautiful views as well as natural air circulation while dining. The interior of the guests rooms were clad in the same natural teak wood as the exteriors but without the charred finish. The exposed natural wood, also used in the furniture, creates a soothing living space that contrasts nicely with the dark exteriors. Simple but luxurious bedding and natural woven textures add a bit of local style into the interior design. 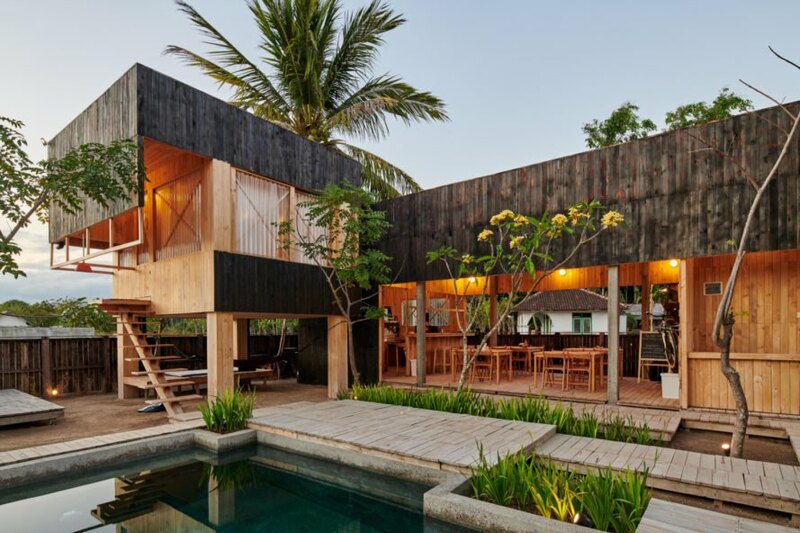 Located on the island of Lombok, the Kiyakabin Resort features four small cabins clad in charred timber. The cabins were built using locally-sourced building materials. Two of the cabins are located on the ground while the third is elevated by stilts. The charred timber cladding protects the buildings from the sea climate. The resort is an intimate, village-like layout with cabins that open up to the Bali Sea. 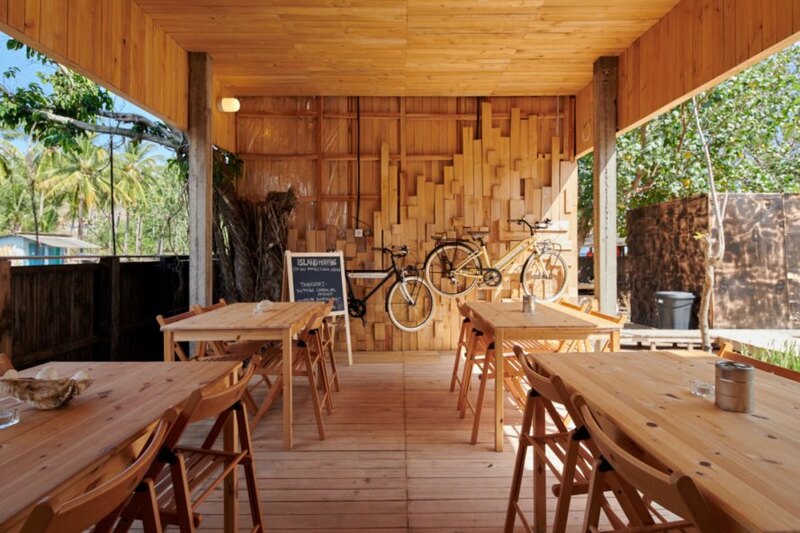 Natural teak wood was used in the interiors. Natural, locally-sourced materials were used throughout the resort. The dining area was oriented to look out over the pool and beach. At the center of the resort is a luxurious swimming pool. All of the cabins look out over the swimming pool. The intimate resort was designed like a small village. The retreat features low-energy building concepts. 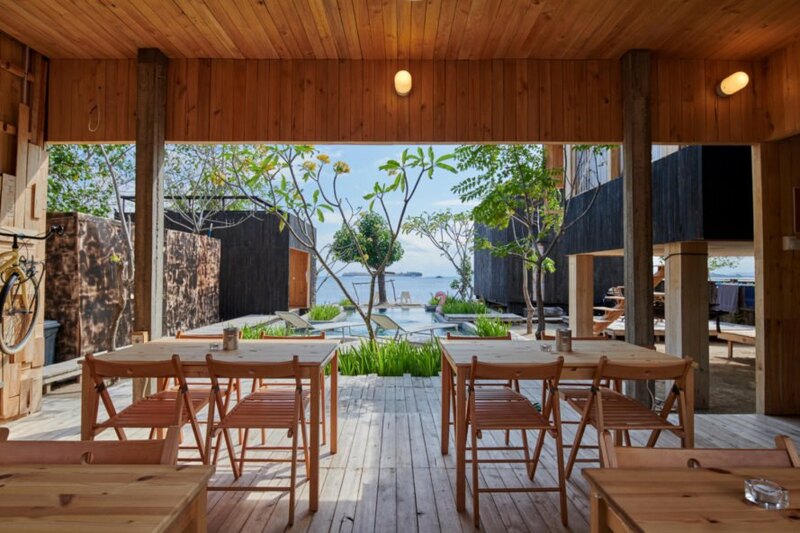 Indonesian firm Atelier Riri designed the Kiyakabin Resort to pay homage to the local culture.